Since 2006, the Omelette Challenge has been a regular fixture on the BBC One Saturday morning show ‘Saturday Kitchen’. The challenge asks the programme’s two guest chefs to make an omelette as quickly as possible using three eggs. The show’s record holder is Theo Randall with a time of 14.76 seconds, set on 2nd May 2015, which has also been officially listed in the Guinness Book of World Records. 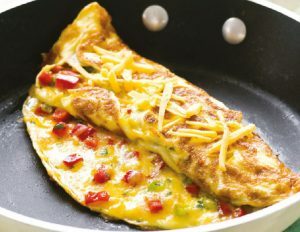 Try the Omelette Challenge with your young people and see how quickly they can make an omelette. You will need to appoint a judge to time competitors and make sure the omelette is completely cooked, raw eggs should not be eaten. 1. Heat some oil in a non-stick frying pan. 2. Crack 3 eggs into a bowl and beat with a fork or whisk. 3. Pour in the eggs. 4. Using a spatula ease around the edges of the omelette and flip to cook the other side.